Last edited by Thrush; 03-25-2019 at 10:31 AM. I think the only 'famous' drummer I've met has been Aaron Solowoniuk of Billy Talent (and got to play his kit...with his band). He himself isn't exactly a drummer hero of mine, but the band has been among my top musical influences since they broke out about fifteen years or so ago. Got to meet Dave Weckl about a month ago at a club in Vienna, VA. I've heard some stuff about him being an egomaniac, but he was super nice and pretty humble based on my experience. He stayed for about an hour after the show just shaking hands with people and signing autographs, no security or anything in sight. I was the last guy up so I got to talk to him for a bit, told him it was a great show, snapped a few pics, and he thanked me for coming out. Weckl is a class act through and through. I feel kind of cheesy saying I met too many to list, but I would kill to hangout with Stewart Copeland. This guy made me giddy and though I’m a huge fan, I cannot say he’s a drum hero. This guy is a drum hero, but I cannot say I enjoyed meeting him. He was kind of a ****. This guy was the coolest, in fact I had dinner a couple of times with him, and I’m definitely not a fan. Yeah, I've heard Rikki is a cool dude. Lombardo is certainly a hero of mine, I'd love to say hi and thank him. Rikki is not a hero, but I like his playing, and I get the impression he's a really nice dude too. He's someone I'd love to meet and talk with. Of the heroes - my true true drumming heroes - I've now met two of my top five. Nicko I've met a few times, and he's honestly the nicest guy you could ever hope to meet. True and utter gentleman through and through, not a bad word to say about anyone, so many stories you could hang with him for weeks and never hear them all. Mike was lovely, as mentioned. The other three? Matt Sorum, Lars Ulrich, and Vinnie Paul. Why? Matt made me want to be a drummer. Lars made me want to play double bass, and Vinnie made me want to play them better. I always wanted to tell VP that, and a fella I met once, whom I said that to, said he'd met and chatted VP several times over the years at various shows (he works many of the gigs and festivals as backstage security) and said VP would actually find that really funny, it's just his kind of humour. Shame I'll never get to meet that big goof! Nice sticks Matthew: I have one too! Maiden appears to be the only older band that not one member is now bald. It’s true! They all really lucked out in that dept. 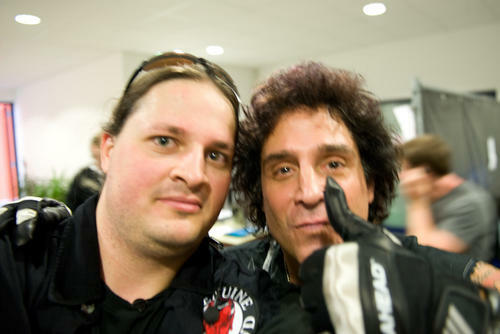 Me (looking like an idiot with the pseudo biker vest I had to wear) with one of my favourite drummers of all time - Deen Castronovo, 10 years ago at a festival somewhere in Germany. You can spare me the petty wife-beating comments. Guy is a legend and will always be one. Great drummer, great singer, seems like a great guy on social media.